ASHIKAGA, Japan (CNN) -- When Bruce Gutlove holds up his vineyard's finest bottle of chardonnay, he sees the clarity, senses the anticipated crisp taste, and savors the hard summer of tending to his grapes. A developmentally disabled student worker at the winery. "Delicious," he said proudly, as the managing director of Coco Farm & Winery. "Hopefully people will buy it and think it is a good bottle of wine, but there is a lot going on behind the bottle itself that we think about when we measure what we have done." Critics in Japan call Coco's wines some of the finest made in Japan, a country known for overly-sweet, unremarkable vintages. It is a compliment that means more to Gutlove than the obvious, for the staff of this unique winery is made up of developmentally disabled and autistic people. More than 100 developmentally disabled people work to create Coco Farm and Vineyard's wines. Gutlove expects nothing less. A winemaker from California, he arrived at Coco Winery as a consultant, planning on a stay of three months. He had no experience with the autistic or developmentally disabled. At the end of the three months, he decided to stay and keep working on the wine. What made him stay, he said, were the students. "Seeing the passion and their desire to create something of worth for other people is very, very impressive." As far as the pairing of autism with winemaking, it is a natural fit. "Autistic people are very detail-oriented. They like the repetitive work and so some of this works very, very well with their personalities." There are no government statistics on the number of people who are autistic in Japan, but the Japan Autism Society believes that number may be more than 1 million. About 67 million people worldwide are affected by autism, according to the World Autism Awareness Day Web site. April 2 of each year has been declared World Autism Awareness Day by the United Nations General Assembly. There are many schools and work programs for autistic persons in Japan, in addition to non-profit organizations that help. Coco Farm & Winery is different not only in the products it produces for commercial sale in Japan, but also in that it operates with a mix of income from sales of the wine, grants from the government, donations, and tuition from the families of its students. The students are paid a "wage" which is then returned to the vineyard as "rent" for their lodging. Machiko Ochi, the daughter of the creator of Coco Farm & Winery, said the success of the vineyard and the students has been in part Gutlove's lack of formal training with the disabled. "Bruce considers all of the residents colleagues," she said. "This is a big distinction. Treated as equals, the residents meet his expectations on the job." Creating the chardonnay Gutlove is so proud of was not easy, especially in Japan's harsh climates. Too cold in the winter and too hot in the summer, the grapes used to rot on the vine. The terrain of the vineyard itself is too steep for machinery, so the students have to tend to the vines by hand. But Gutlove said the students did not let the setbacks stop them from meeting his expectations. Even when Gutlove would get discouraged, the students kept pushing forward. Hiromitsu Watanabe, 28, is one of those students. When he first arrived at Coco Farms & Winery several years ago, his counselors said he could not communicate with anyone. Today, he is thriving in his new environment and talking non-stop. 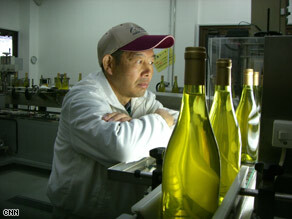 He told CNN his favorite job was putting on the labels and that he makes red wine. Seeing Watanabe's turnaround, in addition to the success of his wine, has been what has kept Gutlove firmly rooted in his adopted land. "I think everyone is being helped here," said Gutlove, "including myself."